Hi. Touchy subject here. I know you don’t really want to talk about me because I make your life a lot easier in some ways, I appeal to your creature comforts, and your house is considerably more quiet because of me, but listen– It’s time to talk. For a lot of you, I didn’t really play a huge role in your childhood. But for a lot of your kids, I am front and center. I am there for them when they need me. And most of them think they need me all the time. Sometimes I am front and center in your life as well. Which may also be why your kid and I hang out so much. Though I have been vilified and revered, the truth is, I am neither good nor bad. I just exist. It is how I am used that is good or bad. And I don’t blame you for how you might use me. I kind of snuck up on you really. It was like I was kind of there in the background of your life, and then very gradually, without you even knowing it, I was suddenly everywhere. Life as you knew it changed dramatically and you didn’t even really know how much it was changing. And to be honest, I continue to change and morph and become even more intertwined in your everyday living at such a rapid pace, you really can’t keep up with me even if you try. At this point, you probably can’t figure out how life even existed before I was around. And as much as I would like to think I am indispensable, that the world revolves around me, and that your kids need me every bit as much as they think they do, I don’t want to live in a world of self-delusion. I’ve been doing some self-discovery and I’m trying to be really honest with myself. And when I dig down deep and look at things honestly, the truth is– life can and did exist before I was around. And it was pretty darn good in a lot of ways that I just can’t deliver. I just hope that in offering you an amazing amount of convenience, knowledge, and entertainment, I won’t also rob you of meaningful interactions with the people and the world around you. You know, the thing is, everything has a consequence, and when I make so many things in your life easy, fast, and convenient, I also make you more demanding, less patient, and less tolerant of hard work. When I offer you a wealth of knowledge instantly accessible at your fingertips, I make you lazy about memorizing and retaining information. When I provide endless forms of entertainment, I take away your desire to reach outside yourself and serve, let alone talk to other people. When I give you the opportunity to say whatever you want to say to whoever you want to say it without having to look someone in the eye when you say it, I embolden your cruel side and stifle your compassionate side. And sadly, it doesn’t stop there. By making social interaction easier, I’ve also made it easier for people to be dishonest and unfaithful in their relationships. The millions of images I carry have caused many to prefer a 2D one-sided relationship to a real, meaningful relationship with another person. Without intending it to happen, what should be held precious has become just an object to fulfill selfish desires at an alarming rate since I came on the scene with billion dollar industries pushing this trend forward. While some of the most beautiful, uplifting words can be found across my face, so can some of the most vile, awful, and destructive messages ever written. I’ve connected the entire world, only to see the rise of massive divisions with the evidence of such littering the comments sections of every news article that graces my face. I can bring families together and I can isolate family members, even when they are in the same room, sitting on the same couch. They are more concerned about their wireless connection than their connection to each other. I am both loved and hated by parents who struggle to know what role I should play in their lives and their children’s lives. I am the subject of a million arguments and the answer to a million frustrations. Across my face, you can see the entire world, from the 7 wonders to your own front door. But because of me, many don’t take the time to see the beauty that exists outside that front door. In making complicated things simple, sometimes I have complicated the simple things. And though I’ve tried to make things easier to save people time so they can devote it to more important things, all my efforts have been negated as millions of hours are wasted by people staring aimlessly at my face. So, I’m sorry. I didn’t mean for it to be like this. I was just trying to help. And I know in a lot of ways I have. I just wish it didn’t come at such a cost. So, will you do me a favor? Before you put me in your two year old’s hand, will you consider how hard it is for you to put me down? And before you give your older kids free access to me, will you consider how your life might be different if, as a child or teenager, you could find the answer to every curiosity- even the ones you weren’t old enough to understand or deal with, with the click of a button in the privacy of your room? Will you consider the people on the other side of my face whose motives are far from pure, who might use me to influence your children? Will you not type something across my face that you wouldn’t say if you were standing face to face? Will you put me down more often than you pick me up and pick up your children more than you put them down? Will you help your children develop a love for the world around them instead of letting them grow up in their own little world? When you see that glazed-over look on their faces, will you send them out the back door? They need you to help them disconnect from their devices and reconnect with the people and the world around them. They need to run through fields, climb trees, and play in creeks or even puddles. They need to climb foothills, build forts, play kick the can, and ride their bikes. They need to laugh and sing and see the sunset. I just can’t give that to them no matter how hard I try. It’s time. We just can’t go on like this. It’s not healthy and, frankly, I’m starting to feel a little uncomfortable about how much time your family and I are spending together. I’m not saying we need to cut things off completely. Just, you know, maybe we should start seeing other people. It’s not you, its me. I mean, after all, I am just a screen. Doublethebatch.com is in not affiliated with Nature Valley. We just really liked the message of this video and thought it was worth sharing. 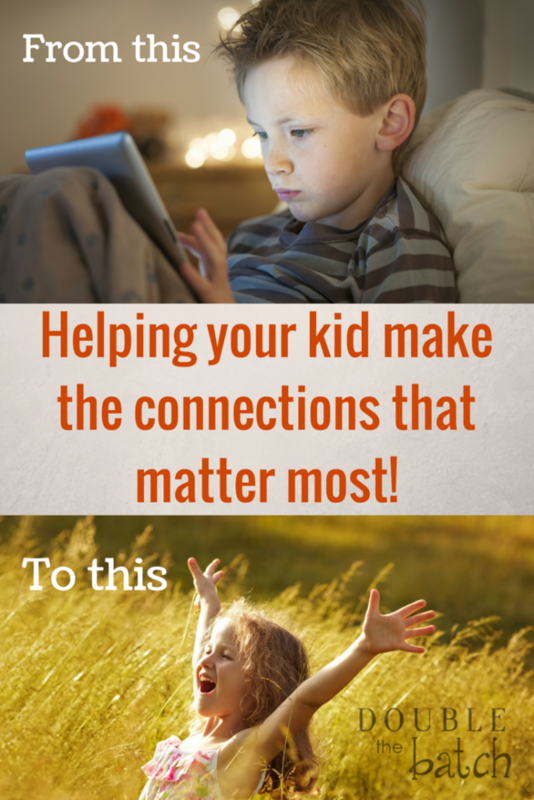 Check out Katie’s great post on how to limit screen time and have fun as a family.